Monochrome TV Receiver has the following blocks. 1. TV Receiving Aerial: the TV signal radiated by the transmitter has to be intercepted. For this an antenna with high gain, Broad Band, highly directional is used. Yagi-uda multi-element array is preferred. Impedance of the aerial should match the impedance of the transmission line. The aerial also selects the required signal and rejects unwanted signals. 2. Tuner: Also called RF Tuner/ Front end. Signals from Aerial are amplified, down converted to intermediate frequency. Band and channel selection is also carried out here. This is a separate, sealed and riveted unit mounted away from other circuits. Unit’s body is grounded to avoid interference by other strong signals. Delayed AGC is used at RF amplifier. 3. VIF Amplifier: The output of RF Tuner has two intermediate frequencies i.e. video IF (38.9 MHz) and sound IF (33.5 MHz), occupying a band width of 7 MHz. Most of the amplification and selection is done here. This is also a separate, enclosed unit. Keyed AGC is used at the base of 1st IF Amplifier. 4. Video Detector: The output of VIF section is around 2 to 5VPP. This is fed to video detector to separate various signals i.e., video, AGC, inter carrier SIF. A special diode driven into saturation has many harmonics at its output. Using LPF, signals above 5 MHz are filtered out. OA 79, Ge, heavily doped, point contact diode is used for detection. 5. Video Output Amplifier: Output of video detector which is around 2 to 5 VPP is amplified by a single stage broad band, voltage amplifier to give an output of 80 VPP. Wave Trap is used to prevent 5.5 MHz inter – carrier SIF (38.9 – 33.4 MHz = 5.5 MHz) and disturb the picture. Output of this amplifier is fed to picture tube. 6. Picture Tube: This is a special type of CRT, having widescreen with wide deflection angle. Electromagnetic deflection and electro-static Focusing is used. H and V deflection coils moulded into a single unit ‘Yoke’ is mounted on the neck. Final anode is applied with Extra high Tension (EHT) which is around 12 to 18 kV. Screen is formed by long persistence P4 phosphor, which is a mixture of cadmium tungstate and zinc sulphide. The light radiated is Yellowish white. With proper output from syn section, picture is displayed on the screen. 7. Sync Section: Output of video detector which is composite video signal has H and V sync pulses either at top or bottom edges. By feeding video signal to sync separator, sync pulses can be separated. We can use clipper circuit when the video signal is with negative sync. Further, by using LPF, V- sync can be separated. Using HPF, H sync pulses can be separated. These pulses are used to synchronize the H and V saw-tooth oscillators. Output of these oscillators are amplified and used to drive the deflection coils on the picture tube. 8. Inter Carrier SIF Section: Output of detector has 5.5 MHz, which is the result of heterodyning between VIF and SIF (38.9 MHz – 33.4 MHz). This has frequency modulated Audio Signal. By using highly selective tuned circuit (sound-take-off coil), 5.5 MHz is separated. 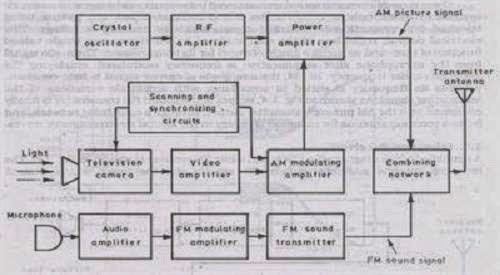 This is amplified and frequency demodulated to recover Audio signal. 9. Audio Section: Output from SIF section which is weak AF signal is amplified both in terms of voltage and power to drive the loud speaker. Finally, we get sound output. 10. Power Supply: Various levels of DC voltages are required for the operation of TV receiver. So, 230 V, 1 φ AC is rectified, filtered and regulated to provide ripple free steady voltage to various stages. However due to many advantages switch mode power supplied (SMPS) are widely used now-a-days. 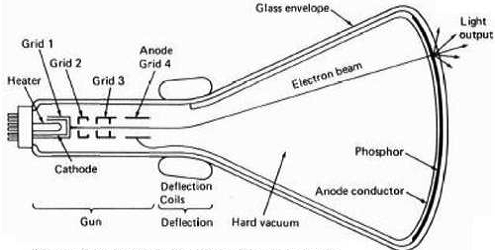 EHT and BHT required at picture tube is obtained from Auxiliary power supply using Line output transformer (LOT/EHT). 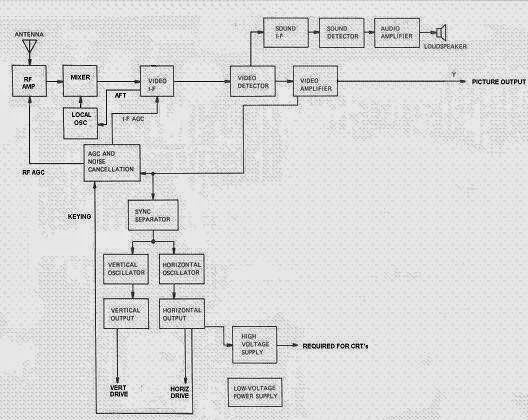 Monochrome TV Transmitter: Figure shows the simplified block diagram of a television transmitter. The video signals obtained from camera tube are applied to a number of video amplifier stages. First stage is located in camera housing to increase weak signal voltage to such a level as to be transmitted over a coaxial cable to the succeeding amplifier stages. Synchronizing generator produces sets of pulses to operate the system at appropriate timings. This unit includes wave generating and shaping circuits. Eg: Multivibrator circuit, blocking oscillator circuit and clipping circuits etc. The repetition rates of the pulse trains are controlled by frequency stabilized master oscillator. The horizontal synchronizing pulses are applied to horizontal saw-tooth generator; vertical synchronizing pulses are applied to vertical deflection saw-tooth generator; two sets of blanking pulses are applied to control grid of camera tube to blank it during vertical and horizontal retrace; and a pulse train consisting all above pulse groups is applied to video-amplifier channel for transmission to receiver. The carrier frequency generated from a crystal controlled oscillator is passed through a number of frequency multiplier and amplifier stages. This results in a production of a carrier wave of desired frequency and energy content. The level of image signals, together with synchronizing and blanking pulses, is raised to modulate this carrier frequency. A high level grid modulation is usually employed. The carrier when amplitude modulated with video signal (BW = 5 MHz) generates two sidebands and the total bandwidth, required for TV channel would be 10 MHz which is too large. Therefore vestigial sideband transmission in which one sideband – (say upper) is transmitted in full along with reduced second sideband is used. For this purpose, output of the final RF amplifier is applied to a vestigial sideband filter which suppresses the undesired portion of the lower sideband of the modulated wave. The modulated RF energy is carried from transmitter to the transmitting antenna by means of a co-axial transmission line. The antenna elevation is kept high for large transmission area. An FM transmitter is used for the purpose of audio signal transmission. The carrier frequency used in audio modulation is 5.5 MHz above that which is used in audio modulation. Both, sound and picture signals are transmitted by the same antenna by using a diplexer called picture – sound diplexer. Composite Video Signal: The composite video signal is the video signal into which blanking and synchronizing pulses are inserted at proper timings. Composite video signal consists of a camera signal corresponds to desired picture information, blanking pulses to make the retraces invisible and synchronizing pulses to synchronize the transmitter and receiver scanning. Video signal of the composite video signal varies in between 10 % to 72 % levels. The 10 % level of the signal corresponds the peak white level while the 72 % level of the signal corresponds to peak dark level. Gray shades are represented by the signals with the amplitude level varying in between 10 % and 72 % levels. Blanking pulses are placed from 72 % level to 75 % level. Sync pulses are placed from 75 % level to 100 % level (both vertical & horizontal during the blanking periods). Peak White level: 10 to 12 % level is called peak white level because when video signal is having this amplitude a peak white spot is produced on the picture tube. Peak Black level: 72% level is called black level. This level produces blackness on the raster. Blanking level: 75 % level is called blanking level because the blanking pulses are inserted at this level. Pedestal Height: The difference between blanking level and average brightness level is called pedestal height. DC level or average brightness level: This level corresponds to the average value of the complete frame. In TV, ‘blanking’ means ‘going to black’ as part of the video signal, the blanking voltage is at the black level. Video voltage at the black level cuts off the beam currents in the picture tube to black out the light from screen. The purpose of providing the blanking pulses is to make invisible the retraces of the scanning process. The horizontal blanking pulse at the frequency of 15625 Hz, blanks out the retrace from right to left for each line. The vertical blanking pulses at 50 Hz blank out the retrace from bottom to top for each field. The time period of blanking pulses is 16% of the each horizontal line, i.e., 16 % of 64 µs = 10.2 µs. In other words, retrace from left to right must be completed in 10.2 µs. The time period of vertical blank pulses is 8% of each vertical field. It comes equal to 8% of 1/50 s = 0.0016 s. In other words, the vertical retrace must be completed within 1.6 ms.
A blanking pulse comes first to put the video signal at black level, then a sync pulse comes to start the retrace. This sequence applies to blanking, horizontal and vertical retraces. To produce a true and undistorted picture, it is necessary that the scanning process at the transmitter camera tube should be quite in step with that at the receiver picture tube. Thus the timing pulses generated by the synchronizing generator to trigger the saw tooth generator for vertical and horizontal plates are not only applied to the transmitter camera tube system but also transmitted to the receiver along with the image signals. At the receiver, these triggering pulses are separated from the signal components, which are then differentiated (horizontal synchronizing pulses) to trigger saw-tooth wave generators for the application of saw-tooth voltage to horizontal and vertical deflection plates of picture tube respectively. The sync pulses and blanking pulses have the same frequency as that of scanning. The values are shown in the table given below. (a).American Standards: Figure (a). The band of frequencies assigned to a station for transmission of the signal is called a channel. Each TV station has a 6 MHz channel within specific bands for commercial broadcasting. (i) Video Modulation: The 6 MHz band width is needed for picture carrier signal. The carrier is amplitude modulated by the video signal. (ii) Chrominance Modulation: For color broadcasting 3.58 MHz chrominance signal has the color information. The color signal (C signal) is combined with luminance signal (Y signal) to form one video signal that modulates picture carrier wave for the transmission. (iii) Sound Signal: In 6 MHz channel, sound carrier signal for the picture is also included. The sound carrier is a frequency modulated signal by audio frequencies between 50 Hz to 15 kHz. (iv) Carrier frequencies: The figure (a) shows how different carrier signals fit into the standard 6 MHz channel. The picture carrier frequency is always 1.25 MHz above lower end of the channel. At opposite end, the sound carrier frequency is 0.25 MHz below the high end. (b).Indian Standards: The total channel width used in India is 7 MHz. The spacing between picture and sound is 5.5 MHz and between picture and color signal is 4.43 MHz. The figure (b) shows the complete spectrum. Sequential and Interlaced scanning: The division of picture into many horizontal lines called scanning. Scanning can be compared with that of reading a page of a book. We start at the top, read all the words in the first line from left to right, and then return rapidly to the left to read the next line, and so on, until we reach the bottom line of the page. Similarly, a camera tube scans the horizontal lines one by one. The television picture is scanned in a sequential series of horizontal lines, one under the other as shown in figure. This scanning makes it possible for one video signal to include all the elements for the entire picture. At one instant of time, the video signal can show only one variation. In order to have one video signal for all the variations of light and shade, all the picture details are scanned in a sequential order of time. The scanning makes reproduction of a television picture different from that of a photographic print. In a photograph, the entire picture is reproduced at one time. In television, the picture is reassembled line after line and frame after frame. This time factor explains why a television picture can appear with the line structure form apart in diagonal segments and the frames rolling up or down the screen. The TV picture is scanned in the same way as you would read a text page to cover all the words in one line and all the lines on the page starting at the top left in figure all the picture elements are scanned in successive order, from left to right and from top to bottom, one line at a time. This method is called horizontal linear scanning. It is used in the camera tube at the transmitter to divide the image into picture elements and in the picture tube at the receiver to reassemble the reproduced image. 1. The electron beam sweeps across one horizontal line, covering all the picture elements in that line. 2. At the end of each line, the beam returns very quickly to the left side to begin scanning the next horizontal line. The return time is called retrace, or flyback. No picture information is scanned during retrace because both the camera tube and the picture tube are blanked out for this period. Thus the retraces must be very rapid, since they are wasted time in terms of picture information. 3. When the beam has returned to the left side, its vertical position is lowered so that the beam will scan the next line down and not repeat the same line. This is accomplished by the vertical scanning motion of the beam, which is provided in addition to horizontal scanning. As a result of the vertical scanning, all the horizontal lines slope downward slightly from top to bottom. When the beam is at the bottom, vertical retrace returns the beam to the top to start the scanning sequence again. To obtain the maximum amount of the picture detail and to avoid flicker, interlaced scanning is used. In interlaced scanning, each picture is scanned twice by the camera. The camera tube first scans the odd lines 1, 3, 5 and so on and skips the even lines 2, 4, 6 etc., unit it completes one field from top to bottom. After the first field is over, the camera tube scans even lines 2, 4, 6 and so on and skips odd lines completely its second field. These two fields are interlaced together from the complete picture as shown in figure (a) and (b). Half i.e., 312 ½ lines are scanned during odd line scanning and 312 ½ lines are scanned during even line scanning. Since two fields are scanned for each frame, the repetition rate of the fields becomes 50 per second. Since 50 Hz is the AC mains line frequency, vertical scanning frequency of 50 Hz simplifies the design of the TV receiver and TV transmitter power supply filters. Also, if interlaced scanning is not used, then there is a large gap between the first line and the 625th line with the result that bottom of the picture looks brighter as compared to the top. Interlaced scanning is best suited for TV Transmission. 2. It is better than sequential scanning. In this every successive line is being scanned. In this the electron beam first scans odd lines from top to bottom and then it scans the lines those are skipped in the previous scanning. The effective no: of pictures scanned per second are 25 frames/sec. The effective no: of fields scanned per second are 50 frames/sec. Total no: of lines scanned at a time from top to bottom are 625 lines. Total no: of lines scanned at a time from top to bottom are 312 ½ lines.